This is Mike’s debut instrumental solo album. 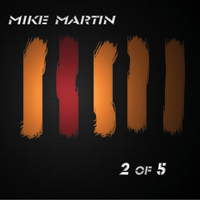 Written and produced by Mike Martin. “2 of 5” is available worldwide via Steve Vai’s Digital Nations Record Label. This song is about the feeling I have when trying to figure out who I am sothat I can be me with all confidence. I am an individual, and yet I am the sum constituent parts of everyone and everything around me. The title is a reference to the Borg character 7 of 9 on Star Trek. I am the second of five children so I thought it was pretty clever. My brothers and sisters and I are all very different people but still manage to maintain a “hive” mentality to protect the “collective.” This song is about me acknowledging that I am because they are and we all have the responsibility to represent each other as we present ourselves while still declaring who I am as an individual. The guitar theme was written sometime back after I was getting accustomed to my seven-string guitar. It sat on the shelf for a while until after September 11th, 2001. The feeling of patriotism I felt everywhere was amazing. I think I finally understood what it is to feel like an American. My father and his father were both military and served in times of war. I have many friends who serve in the armed forces to protect the very freedoms I take for granted everyday. This song is dedicated to all of those who serve, putting their lives on the line and their families that sacrifice with them in the name of freedom. Love is a powerful thing. Ideals are too. I am an idealist learning to be a realist. I wrote this when I was eighteen and in my first significant relationship. I had an ideal of what love was supposed to be. Her grandmother told her that she always pictured her being married in a field of lavender. This is my interpretation of that picture. One of the hardest things for me to do is sit down and write a genuinely happy song. This one just about wrote itself. I was in a good place in my life and was finally able to afford my own apartment with no roommates completely on my earnings as a musician. It was only two tiny rooms and I had to share a hall bathroom with other tenants, but it was a great moment in time. It was here that I wrote this song. I wrote this piece at a time in my life when I was questioning everything. I often sit and improvise solo guitar pieces as meditations and this one stood out. Part became the Prelude and the rest Epiphany. For me, this piece captures the frustration I was feeling at the time as I was beginning to realize that not everything in life goes according to well laid out plans. My moment of clarity. The effects of this time changed my life and perspective. used it as inspiration for this song. I like the guitar tones on this song. It’s straight up old school rock guitar. The idea here is that I never really had a choice to be a musician. My desire to play the guitar is beyond any obsession or addiction. I simply must. Music is an infection, and I have the disease. The main guitar theme has been an idea I’ve been stewing over for a couple of years. Looking for something to do with it, I scored it out for full choir and the piece came to life. The choral textures lead me to write the interlude and it all came together. Here the interlude is orchestrated for guitar and mellotron strings. I like the feeling that this song continues to grow over time so I resisted the temptation to overdub an orchestra of guitars and left the main theme for guitar very simple. The concept for this work is the feeling of truly wishing someone peace. We say it all the time, but I imagine a deep meditation, a prayer to take away a loved one’s pain and take it on myself, and with this focus, we can start to realize peace.